Alan Yarmark moved to Cotopaxi, Colorado., in 1971 and set up a pottery studio. Developing a style of his own, Alan started formulating shiny glazes of blues and bright colors, which have remained his trademark. After eleven years he moved his studio to downtown Salida, CO and started his first retail store. Still doing retail shows and renaissance fairs, Alan also sold to stores throughout the USA. 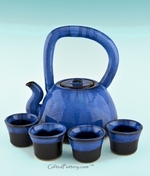 Each functional piece of pottery is dishwasher/microwave/oven safe and lead-free. In 1996 the pottery moved once again; this time to Villa Grove, Colorado. Alan and his wife and partner Diane, also offer Casa Azul’s B & B & Pottery Retreat where one can stop for overnight or several days, and also try their hand at making a piece of pottery. Alan travels extensively throughout the world visiting fellow potters and ceramic artists.